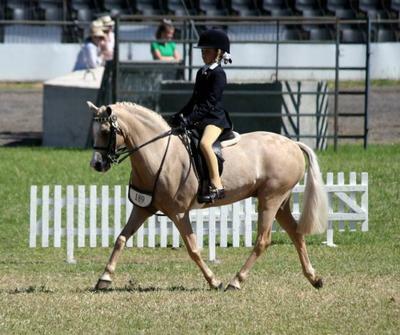 Emmerson Ball, 8 years old, of Lake Macdonald, Qld, and her palomino pony gelding, the super Barjack Mr Bojangles, have had a fantastic year so far. Emmi has owned "BJ" for almost 2 years now and this year has seen the pair win multiple broad sashes around the SE Qld show circuit, including a Grand National qualifying win of the Girl Rider class 12 years and under at Toowoomba Royal. The pair also took out the Palomino Under Saddle win at Brisbane Royal, competing against mainly adults and the Colourama Under Saddle Exhibit at Brisbane Royal too. BJ took her to 4th place out of 25 riders in her rider class. The pair won the Supreme Palomino Under saddle Perpetual trophy at last year's Dilutes Spectacular but will sadly have to forego another challenge this year as they will be at the Qld Country Hack Championships where last year they took out Ch. First Ridden and BJ piloted Emmi to a win in her rider class and third in the Sml Hunter Pony. Barjack Mr Bojangles - the 11.2hh super palomino pony and Emmerson Ball - truly are a great little team. Best of luck for the rest of the season including the Qld Country Hack Championships and HOTY!!!!!!!!!! Comments for Barjack Mr Bojangles and Emmerson Ball 8 years old. Fantastic website. Plenty of useful info here. I¡¦m sending it to some buddies ans additionally sharing in delicious. Barjack Mr Bojangles has piloted Emmerson Ball to win Rider 12 Years and Under at the 2012 Qld HOTY!!!! Once again, congratulations to a super rider and fabulous little pony. Go Emmerson - all your hard work is paying off!!! Well done Emmi, BJ, Caroline and Darren. Great pony and talented rider with awesome strappers!!!! (aka Mum and Dad). Little ponies like BJ are worth their weight in gold (pun! )taking care of their little jockeys in the big arenas. Good luck at HoTY. Congrats Emmi and BJ, you are fantastic at what you do. all the best for the rest of the season. You guys are a awesome team! and I hear you have another super pony waiting in the wings. Congrats and all the best for the forthcoming comps.